When we started this business in 1985, typewriters were state-of-the-art. technology in our field. We’ve changed much since, but our mission has stayed constant: to maintain a dedicated team who provide our Clients with translations of the highest quality. Many Clients have been with us for more than two decades, valuing our discretion, professional service and individual attention. Our translators include specialists with long experience, broad knowledge and education in various fields of expertise as well as younger people who contribute excellent training at a level unheard of in previous decades, and with a knowledge of the contemporary world. We share a fascination for the translation profession which enables us to continually learn new things..
We have business liability cover. Our standard practice is to retain translation files on our computers for three months. At your request, we will remove all your files after the order is completed. Some Clients prefer to have their files retained for longer periods because they can get subsequent translations of the updated version of the same documents quicker and cheaper (e.g. current company information from the Companies Register). Our translators are bound not to disclose information they come across at work. Each translator obtains access only to the range of information which is required to perform the job. We do not provide third parties with information on the documents we translate nor on who our Clients are..
We have been around since 1985. We are the second oldest translation agency in Gdynia and one of the first in Gdańsk. Since our inception, we have provided services both to local business giants and to individuals, enjoying their confidence. Business and private matters alike deserve the highest level of confidentiality. For this reason, not only do we never disclose any details of matters brought to us by our Clients but we also do not disclose their names. Confidentiality is one of the major principles we adhere to in our work. 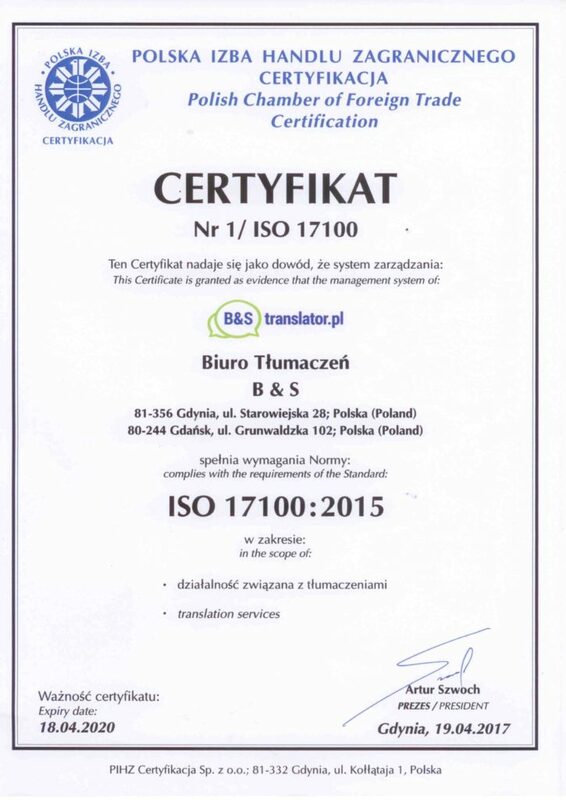 The ISO 17100:2015 Certificate confirms high quality of our services.